The holidays are joyful in many ways, but they can also be tough. Skipping Christmas is often wished for through difficult circumstances and going through each day with merry measure, being joyous all together, simply may not happen. We all have problems we’re dealing with on various levels. No one is exempt and as we turn on the news, trying to be joyful in a world filled with so much tragedy isn’t easy; it’s hard enough to comprehend. So I’m offering a little bit of good cheer and inspiration. It’s not a lot and it might not help. Then again, it might make a difference for even one person reading, which would mean the world to me. 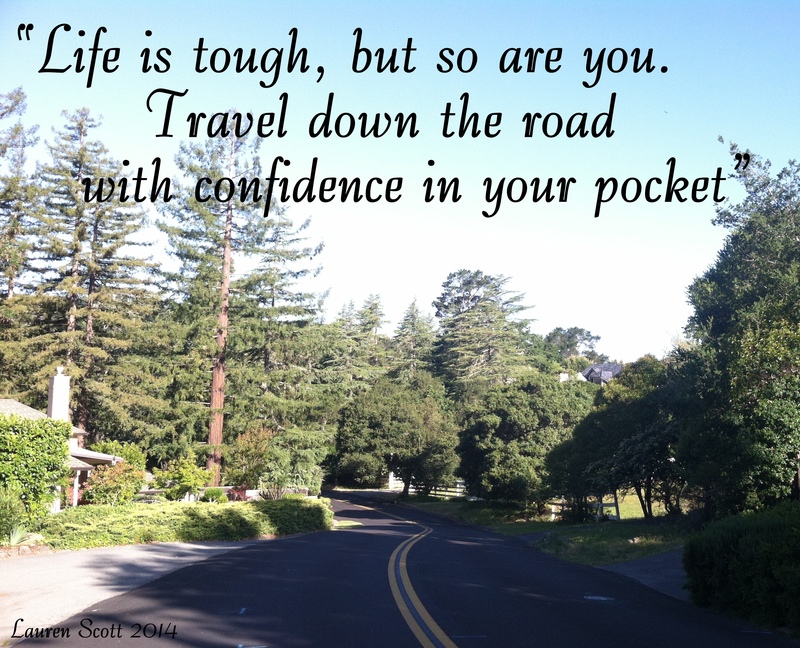 Remember, while the road may be unpredictable, you’ll always have “tough and strong” to lean on. and wishing you all a very Merry Christmas! Thanks a lot Lauren. The best of luck to you too. You’re welcome and thanks, too, Joe! Happy Holidays and have a wonderful weekend! What a wonderful message! Thank you! Happy holidays to you and your family. Life is full of swings and roundabouts. I always think that when things are going well we should grab life with both hands as these good times will help us through the bad. Happy Christmas. Hope it’s a great one for you. This was a very caring and thoughtful post. Very nice Lauren. I know. I try to ignore the ugliness but I can’t. Like you say it’s always right in front of us. Have a peaceful holiday. Thank you for reminding me to shed some light this holiday season. Happy holidays to you and yours, Lauren. You’re very welcome, John, and thank you for your insightful comment, too! Wishing you the same! Only a little bit of good cheer and inspiration ? !!! Plenty of them dearest Lauren ! Most cheerful and encouraging your warm post ! Love the image of the road with the gorgeous leading lines ; how effectively prepares the viewer for the unpredictability … Well,Cheers & Seasons Greetings! Everyone has their problems, and it can be a tough time for some. Sometimes you just have to push through the bad times and try to make it through. That’s really all we can do, Binky! I hope you have a wonderful Christmas with all the Wombies! Love, blessings, and joy to you and the family, my sweet! May 2015 be marvelous and exciting, fulfilling and inspiring. May it be filled with much Love, Happiness and Joy. Thanks so much, Ian, and may your Christmas be filled with all the same! Thanks so much, Stefan, and I hope you had a wonderful Christmas! I wish you a new year filled with much love and joy! Thanks so much, John! I hope your Christmas was joyful and wishing you a very Happy New Year!